Though still packing a major wallop, Major League Baseball spring training camps opening is always a positive sign that winter is subsiding in the Great White North. Buzzing with activity, Florida and Arizona are hardball epicentres during February and March. 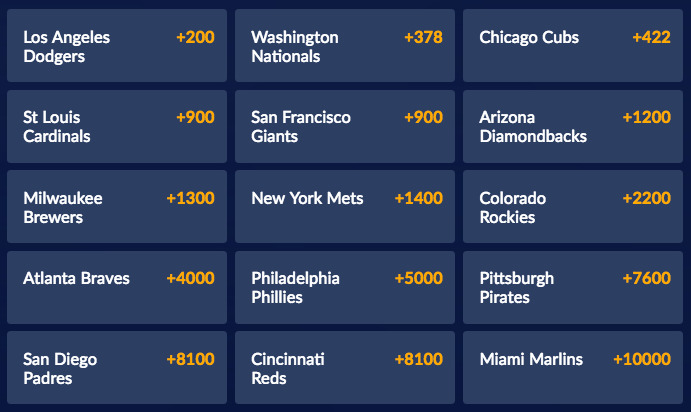 With Grapefruit and Cactus Leagues firing up, online bookmakers have posted 2018 National League Championship futures odds. Still an extremely stacked squad, the Los Angeles Dodgers are reigning NLCS title holders and top chalk. Unlike the American League, where five teams own 31 of the first 48 ALCS Pennants, seven squads have captured a combined 38 NLCS titles. St. Louis leads the pack, with seven NL Championships, while Los Angeles with six, plus Cincinnati, New York, Atlanta, Philadelphia and San Francisco with five, are the most decorated squads on the Senior Circuit. Delivered by some of the best baseball bookmakers in the business - our widget below displays LIVE odds throughout the MLB season. Almost as old as dirt itself, the Los Angeles Dodges franchise has roots that stretch all the way back to their days as the Brooklyn Grays in 1883. In the more "here and now" the LA Dodgers landed in Southern California in 1958 - after participating in six of the previous eleven World Series (1-5) as the Brooklyn Dodgers. Establishing themselves as the top NL team, players like Sandy Koufax and Don Drysdale helped the SoCal Crew claim three of the next eight MLB Championships. Kirk Gibson and Orel Herschiser led the Boys in Blue to their latest Fall Classic crown during the 1988 season. Following a 28-year drought, that included ten failed playoff appearances, as cast of many led the Dodgers back to the World Series last season. Though they came up short again, losing 4-3 to the upstart AL Champion Houston Astros, Los Angeles certainly added plenty of spice to the thrilling 2017 MLB postseason race. Back en masse, including studs like Justin Turner, Kenley Jansen and Clayton Kershaw, there is little reason to doubt the Dodgers making a strong run at their seventh NLCS crown. There is some stiff competition standing in their path to repeat as NL Champs though. Loveable playoff losers, Washington has lost in the NLDS during four of the last six seasons, the Nationals are just ahead of the Cubbies as second chalk to claim the 2018 NLCS. Along with the Milwaukee Brewers, the Nats have never flown a National League Pennant during their first 49 seasons that were split between Montreal (36) and The District (13). Similar to the Blue Jays, the Nationals window of winning is closing as stars like Max Scherzer (33) Ryan Zimmerman (33) and Stephen Strasburg (29) are aging some. It helps that the Nats are part of a weak NL East Division. Forgiven if they were experiencing a hangover, after capturing their first World Series in over a century during the 2016 MLB campaign, Chicago was slow out of the gate in 2017. However, despite a middling 40-41 first half, the Cubs got on track and posted a 52-29 second half mark to earn a third straight MLB postseason berth. After putting away Washington (3-2) in the NLDS, Chicago crashed early and often during their 4-1 NLCS loss to the Dodgers. While a lot (too much) is being made of Chicago acquiring pitcher Yu Darvish - the Cubs are a solid 2018 NL contender. St. Louis, who pillaged during the Miami Marlins clear out by scooping up power-hitting LF Marcell Ozuna, and San Francisco, who lost out on all of the big free agents they targeted, lead the second tier teams on the futures board at SportsInteraction. The Cardinals finished four games out of a 2017 NL Wild Card spot while the Giants (64-98) tied Detroit with the worst record in the Majors. Understanding St. Louis and San Francisco are perennial contenders, betting on past laurels is not something we are into. Backing either team is a risky move - we will stay away from both squads. Arizona, Milwaukee, New York and Colorado round out the mid-range chalk and all of them have steep roads ahead. The Diamondbacks and Rockies have to contend to with the Dodgers in the NL West while the Mets and Brewers have the Nationals and Cubs ahead of them in the NL East and Central respectively. If forced to take any of those teams, 2017 NL Wild Card winner Arizona seems to be the safest investment as the D-Backs posted a solid 93-69 record last season. The Brew Crew battled the Cubs all year but they are a young squad that's been very quiet during the offseason. Senior Circuit underdogs are a six-pack of squads that have experienced way more losing than winning recently. Atlanta is lowest priced pup as the Braves look to end a four-season playoff drought. Sinking like a stone, after five straight playoff appearances and one World Series title, Philadelphia has posted a 427-545 record since they lost to the Cardinals during the 2011 NLDS. Earning three straight NL Wild Card berths, from 2013 - 2015, Pittsburgh has posted back-to-back losing seasons and the Pirates future is fraught with more questions than answers at this point. A record setting signing of Kansas City stud Eric Hosmer, during a busy winter in San Diego, won't be enough to push the Padres into contention. Earning a fourth playoff berth, over nine seasons, looks like a pipe dream for Cincinnati after the Reds posted a 276-372 mark during their past four campaigns. Holding yet another offseason fire-sale, the Miami Marlins, who won the World Series in 2003, are a lock to miss the MLB postseason party for a 15th straight season. Stay away from all six of those squads when purchasing NLCS futures tickets at these top ranked online sportsbooks.